Sometimes I let this blog get too ponderous, theoretical, and otherwise academic. I’m trying to enjoy my Christmas break but it takes awhile to break out of normal school rhythms. Last December, I wrote on some well known Christmas classics (Charlie Brown Christmas, Holiday Inn, Miracle on 34th Street) and tried to mine them for some new insights about sociology, evangelicals, and popular culture. I’ve been thinking all year that there was probably something to be learned from A Christmas Story (1983) — Jean Shepherd’s reflections on growing up in Hammond, Indiana in the 1940s told in his book In God We Trust: All Others Pay Cash. I decided to re-watch our copy before TNT started their 24 hour marathon showing tomorrow. I noticed that it really hasn’t aged well. Too many of the vignettes are loosely connected and didn’t manage to convey the humor and pathos I remembered watching it with our kids every year. But it still tells a story that may help us understand the changes going on in the current “millennials and church” conversations. 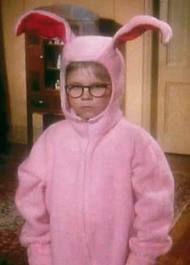 If somehow you’ve missed the story up to now, it’s all about Ralphie. As he and his family are approaching Christmas, the primary thing on Raphie’s mind is “an official Red Ryder, carbine action, two-hundred shot range model air rifle”. It has a compass in the stock and everything. It’s the kind of gift kids dream of. But absolutely everything and everyone stands in his way, constantly telling him “you’ll shoot your eye out”. He has good friends, lives in fear of neighborhood bully Scut Farkas, has a father who swears and wins Major Awards, and a mother who is doing all she can to keep the family happy. There’s a lot more. If you’re interested, it will be on TNT 12 times between 8:00 Christmas Eve and 8:00 Christmas night. Maybe you can catch it then. Even though the story was written in the 1960s about events in the 1940s, it struck me that Ralphie as we’ve known him is a millennial. He shows up in the early 1980s and his story is full of millennial angst. Since it’s been on cable television every year since 1988, an entire generation has grown up with Ralphie and his quest for the Red Ryder. Consider Ralphie. He grows up in this family that thinks it’s cute for him to wear his bunny pajamas he got for Christmas. What he wants is to be the sharpshooter who saves the world from evil. He lives in fear and awe of his father, who can’t see how his frequent profanity has influenced his son to become quiet fluent in cuss words (including THAT one). His father wins A Major Award (the infamous leg lamp) that he places in the front window for all to see. He’s proud of his achievement but is the only one who doesn’t know that the lamp is an embarrassment (which is why the wife “accidentally” breaks it). Ralphie wants one thing. The one thing that would make him cool and accepted in his own terms. But every authority figure he meets seems bent on crushing his dreams. He tells Santa that what he really wanted was a football until he gets his courage up to tell what he really wants (and then Santa tells him he’ll shoot his eye out). The neighborhood bully represents the fear of evil. A running bit throughout the movie has Ralphie and friends running from Scut Farkas to avoid the inevitable fight. One of the friends inevitably gets cornered until he cries “Uncle” and the others watch from a distance. Until the day when Ralphie can’t take it anymore. Suddenly he attacks Scut, swearing a blue streak while landing punch after punch. In short, Ralphie feels trapped by his neighborhood, by his family, by the gap between his expectations and dreams and the conventional expectations. He has dreams but feels like they may never come to pass without something shifting. If they all understood what he’d do to protect the family against Black Bart, they’d all be forever in his debt. Of course, at the end of the story (spoilers ahead for the two of you who don’t know how it ends) he gets the BB gun. He takes it outside to try it out and manages to have a BB ricochet and nearly hit him in the eye. It was just as they’d all said. Except that his mother keeps his secret and cleans him up. He pursued his dream and it almost went wrong, and yet he found his own way forward. In that moment, he finds his independent voice that isn’t defined by his family, neighborhood, and social structure. This is where today’s millennial evangelicals find themselves. They’ve gone out into the backyard to try out some approaches that the authorities said were too risky. But they’re doing so with courage and abandon. Sometimes they get it wrong, but they are willing to stretch beyond past limits. Just like Ralphie, they love their family (even when they embarrass them). But they have a commitment to Christian faith to live out and simply pray that their families and churches make room for them.